Fine Swiss watchmaker Ulysse Nardin is celebrating the 20th anniversary of its Marine collection with the unveiling of a new timepiece destined to become one of the best classic sailing watches: the Marine Chronograph Annual Calendar. Made entirely in-house, the timepiece is designed to offer technological simplicity and quality easy-to-use functions all contained within a sleek, understated 43mm package. Lying halfway between a perpetual calendar and simple calendar, the titular annual calendar function has been developed to last for one year without adjustment. It is mechanically programmed to recognise months of 30 and 31 days and therefore will only need adjusting at the end of February. However, unlike more traditional annual calendar complications which typically contain around 30 components, Ulysse Nardin’s system contains only 12 – quite the feat in modern watchmaking. The timepiece, of course, is finished with a sapphire crystal caseback so you can admire the creator’s cutting-edge technology. Powered by the new UN-153 calibre self-winding movement, the Marine Chronograph Annual Calendar also features a chronograph function with a 30-minute counter, hour counter and small seconds counter with integrated month display. Aesthetically the new addition to the Marine range lives up to the name with its deep blue dial, ribbed bezel and screw-crown offering water resistance up to 100 metres. Also boasting a 52 hour power reserve, this is the perfect piece for intrepid sailors or casual cruisers alike. 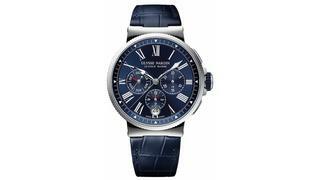 The Ulysse Nardin Marine Chronograph Annual Calendar is available to buy now, visit ulysse-nardin.com.